Manousso.net | Jesus and angels captured on film at St. Peter's Basilica in Rome, Italy. The white form in the ray of light was not there when John took this photo. Neither were the angels by the window, by the people, or behind the man in the wheelchair. Find out more about our miraculous photo. John Manousso took this photo in Rome, Italy, on 18 May 1995 at St. Peter’s Basilica in front of the altar over St. Peter’s crypt, while visiting family in Italy on our way to Santorini, Greece. John was not going to take any photos because it was about 5 P.M. and quite dark in the unlit church from the overcast sky. As John and I, his wife Barbara, discussed whether it was too dark in the church to take a photo, risking another indistinct European church picture, a young couple pushed a man in a wheelchair in front of the line of vision to the tomb. 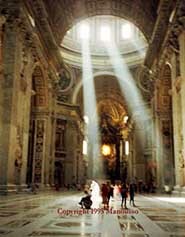 The couple talked for two or three minutes with the man in the wheelchair in one of two strains of light, which beamed down from the dome, barely making St. Peter’s altar visible in the background. Then the friends went to the right, and the man wheeled his chair to the left. To compensate for the poor light, John opened the lens manually of his mini-zoom 35-70 Leica, pointed, shot, and expected an obscure frame with his Kodak 200 film. John took five more photos, finished the roll, and we left. Upon leaving the basilica, we took all ten rolls of film from our travel through Budapest, Vienna, Venice, and Rome with 24 frames each to be developed in a little photo shop near John’s uncle’s condo in Rome. John was worried about exposing our film to airport x-ray security devices while we continued our trip through Europe. Since the photos were quickly machine processed, within a few hours, John and I stood in front of the photo shop and flipped through our travel photos. When we got to the photo taken in front of St. Peter’s tomb, we froze and simultaneously pointed at the solid white celestial figure looking over the man in the wheelchair inside the misty beam of light! We both knew that no one had crossed through the beam of light because John had purposely waited for the people to clear the beacon of light. No statues or paintings were in the middle of the floor, and, as we discovered on a subsequent trip, even within that immediate area. While taking the photo, nothing peculiar had happened or had been visible to our eye. To better see the details of the photo, click here. For a detail of the glowing window in the back of the basilica, behind St. Peter’s tomb, click here and scroll down page. By chance, about one minute after John took this photo and two photos of me, a man passing by took our camera and shot two pictures of us standing in the misty light; no statue or apparitions appeared with us. To assure ourselves of this unexplainable photo, upon returning home, we had our camera checked for a mechanical problem: There was none. We then had the whole role of film forensically analyzed for double exposure or superimposition: All twenty-four frames were centered. In Houston, Texas, National Photo Lab (NPL) granted us a Letter of Authenticity. We have no scientific explanation for John’s photo, just awe for capturing a miracle. However, we believe that John took this photo for a reason and a special mission. A copy of this photo can be seen in Houston at the M.D. Anderson Cancer Center, Holcombe Blvd, on the first floor opposite the entrance of the chapel, near the cafeteria. Jesus and angels captured on film at St.Peter's Basilica in Rome, Italy. John Manousso talks about his photo.